These workshops are a perfect way to learn a specific craft or skill. All abilities are welcome and, as always, tea, coffee and home made cakes are provided ! If you don't see anything here that takes your fancy at the moment, please stay tuned - this list is updated regularly so something you might be interested in could appear at any time. Please contact me (Email: Mail@HilaryJanes.co.uk or call 077 988 37601) to reserve your place. Fee refundable if two weeks notice of cancellation is received. Workshops are held at Hilary Jane's workroom in Leigh-on-Sea, Essex or at the Create98 Art Studio, also in Leigh-on-Sea, Essex. Bespoke workshops and parties can also be arranged at a venue of your choice - please contact me to explore the possibilities. An afternoon creating a fabric folder to store your unfinished pieces. Various folder styles will be demonstrated. A requirement list will be supplied on booking. Fee: £20 Tea, coffee, home made cake included. Held at Hilary Janes Workroom, Leigh-on-Sea. Places are limited to six people and fee must be paid two weeks prior to workshop. Come and make an embroidered lined purse. An afternoon workshop of stitching whilst making a delicately embroidered purse. Fee: £30 Tea, coffee, home made cake and all materials and instructions included. Places are limited to six people and fee must be paid two weeks prior to first workshop. Tuesday 14 and Tuesday 21 May 2019 7:30 pm - 10:00 pm. Come and learn the different techniques in making a hand-stitched patchwork wall-hanging and produce your own hanging to take home. Come and create a simple applique beach scene picture. 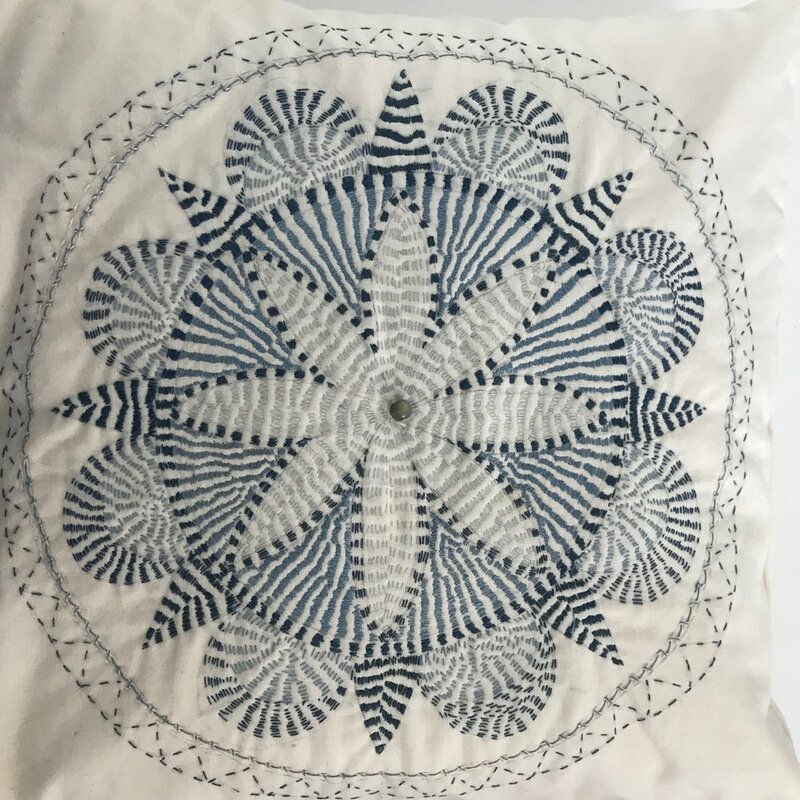 During this workshop you will explore the various methods of hand applique and embroidery stitches to embellish your picture. This is a great introduction to hand stitched applique and embroidery. Taking inspiration from the summer garden Hilary will share with you the various shapes you can use to create beautiful fabric flowers. These flowers can be made into pictures, headdresses, garlands or small arrangements. This is always a fun workshop. More Spring/Summer Workshops will be added here very soon.